What is Umbraco ServerVariables Parsing? Why would I use Umbraco ServerVariables Parsing? 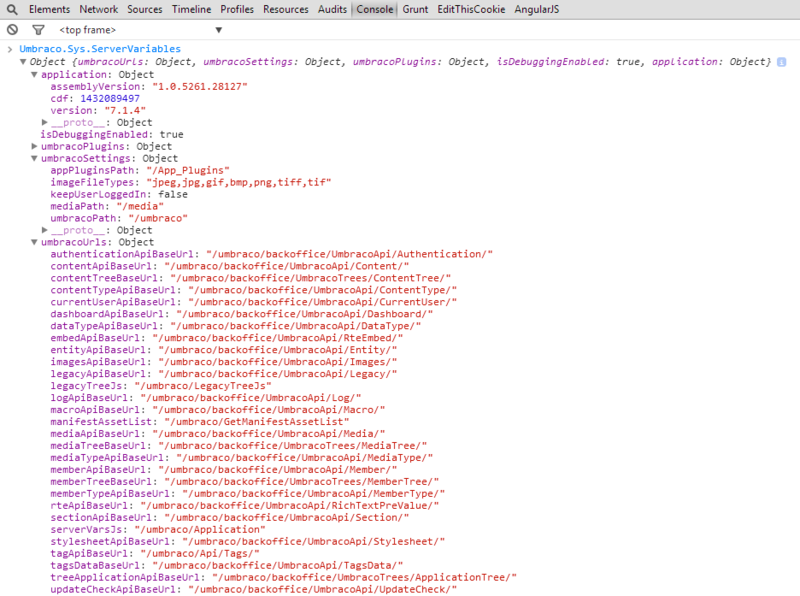 You may wonder why you would want to store the URL to a WebAPI. A good example is that in Umbraco introduced a breaking change based on how certain WebAPI URL endpoints are structured. So depending on what version of Umbraco you are using you can on Application Startup of Umbraco detect what version and use the correct URL format for the WebAPI, as opposed to traditionally putting the URL into your AJAX JS calls and it breaking between specific versions of Umbraco. How do we go about using ServerVariables Parsing? Now we know What & Why we would use ServerVariables Parsing, we can go on to know how to use this with a simple example & then followed by a more complete or real world example. 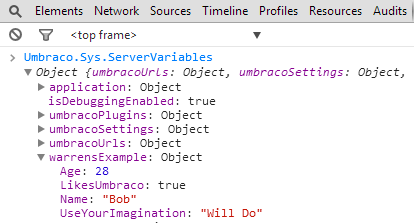 Firstly start up a latest Umbraco 7 site and login to the Umbraco back office, from here open your browser developer tools and in the console type the following: Umbraco.Sys.ServerVariables you will see something similar in your browser developer tools. However the example I gave is not overly useful and a more real world example is to add WebAPI Url endpoints. This snippet below is taken from Shannon Deminick’s Umbraco Blog Package Articulate which uses a URLHelper to figure out what the WebAPI Route URL will be. Hopefully now you have a better understanding of Umbraco ServerVariables Parsing along with how & why you would want to use it. I’ve used something similar on other sites (not via this method though). If you want a real world example I started sending the server date down the wire so my client side validation to make sure dates were not in the past used a datetime I knew to be right as sometimes clients machines have duff dates set on them. This would be a great way to get that server datetime down the wire. Glad you found this a good read Pete. Always nice to hear & get feedback. So for me to understand your example fully, you was sending the server’s datetime into the JSON object so that you can use it to help invalidate the client’s browser cache of resources such as JS & CSS files, yes?